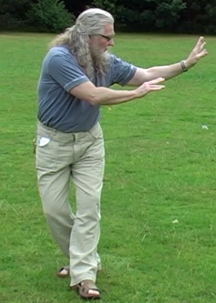 Erle Montaigue taught "Small Frame" at his 2010 Summer Camp. The whole camp's theme was "Small Frame", allowing students to see and participate and learn the highest levels of just about everything. Even if a student is not ready for this level of learning, it is always important to see their teacher doing the highest level so that their inner mind knows what is to come. Here, Erle teaches an exciting area of "Small Fa-Jing". We begin with the larger fa-jing which is by the way much smaller and more explosive than what most teach. Then we take it down into small fa-jing where there is hardly any body movement. Erle demonstrates this power on punching mitts which shows that even more power can be got using Small Frame Fa-Jing. He then continues this way and takes you into Healing Fa-Jing which is often called "Acupuncture Without Needles". This is where we take that immense power generated by Self Defence Small Fa-jing and put it into the internal realms so that only the "Energy" or "Qi" is emitted into the acu point that needs healing. This is the highest level of healing and necessary for all acupuncturists who only know where to stick needles but who do not know how to "put energy". Erle also covers an important area of Small Frame Push Hands of which there are three methods: High, Middle and Low. It shows that you do not need to hold your arms out from the body in order to stop powerful attacks. Attacks happen in your face, so this way of push hands takes you into the realms of self defence push hands and works hand in hand with "Small Fa-Jing".